Home » Knowledge Base » Software » Zotero - Reference Management » Firefox error - "The Zotero database cannot be opened"
Firefox error - "The Zotero database cannot be opened"
If you encounter an issue with Firefox that reports "The Zotero database cannot be opened. Make sure you have read and write permissions for all files in the Zotero data directory. ", you will need to make a copy of your Zotero data directory, create a new profile, and copy the data back. This is not too technical of a procedure given how Zotero stores in data, however, please feel free to contact a member of the technology department if you require any assistance with the following instructions. 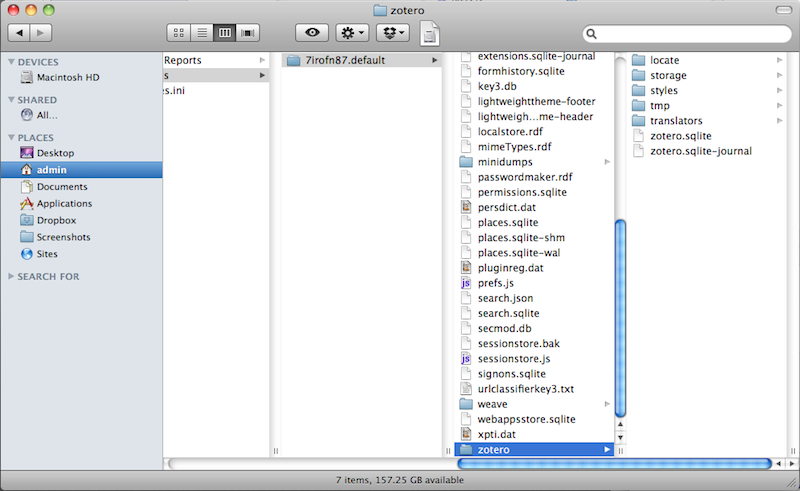 Drag the 'zotero' folder within there to your desktop, and leave this Finder window open. Open the 'zotero' folder your just moved to your desktop and verify that it contains some data, specifically a folder named 'storage' and a file named 'zotero.sqlite'. Open Firefox to allow it to create a new Zotero profile. You should find that Firefox loads correctly and you can access Zotero, albeit without your data. Close Firefox, and then drag the 'storage' folder and 'zotero.sqlite' from the folder on your desktop to the newly created 'zotero' folder back in your Firefox profile. You should now be able to open Firefox one more time, access Zotero, and find all of your resources listed.